Only 8 left! 8 items in stock. These simple switches are the Mechanical Bumper sensor for the SparkFun RedBot, giving you the ability to detect a collision before it really happens. 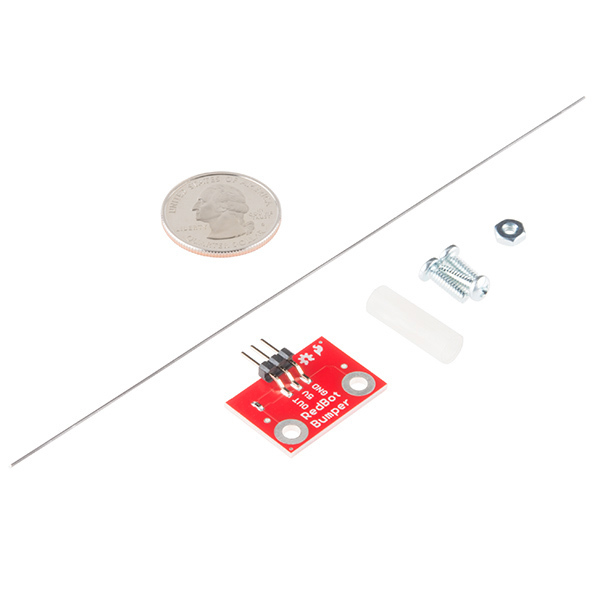 This sensor works by acting as a SPST switch. When the "whisker" bumps into a foreign object it will make contact with a nut next to it, closing the connection and, by default, turning off the motor. By attaching these mechanical bumpers to you robot the whisker will bump something before your robot crashes into it. The sensor has a 3-pin header which connects directly to the RedBot Mainboard via female to female jumper wires. 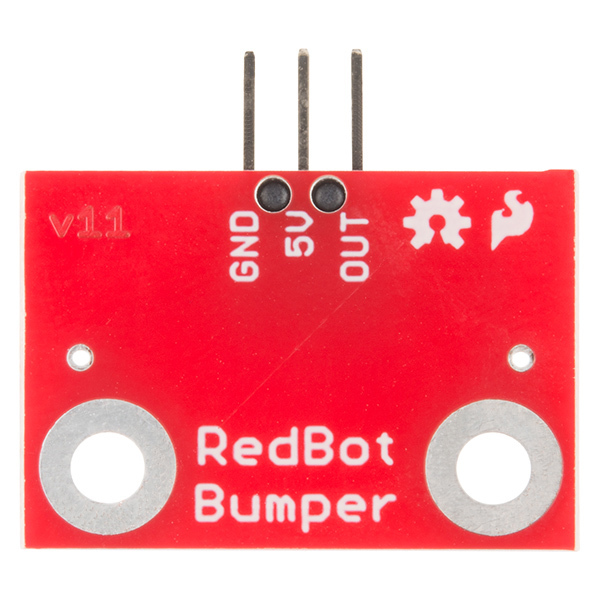 Use the included RedBot library to make sure your robot never crashes into anything again. 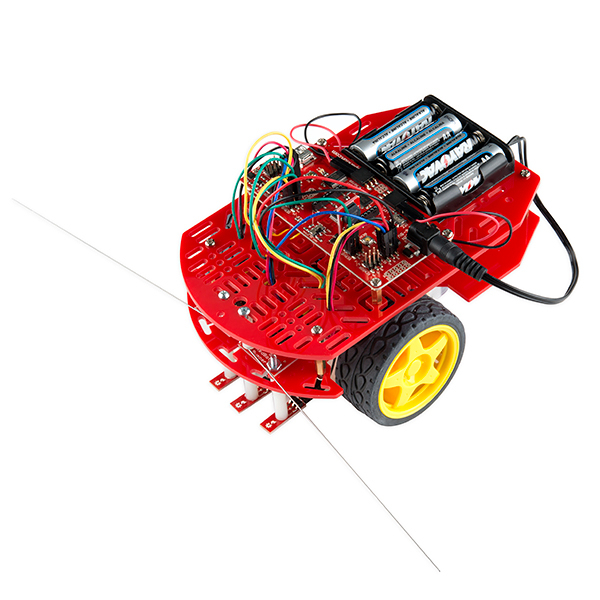 Check out the entire RedBot family of products! 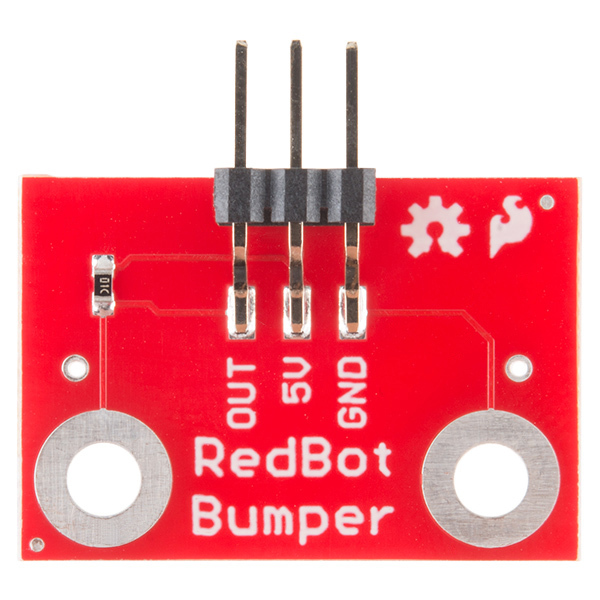 Note: Our RedBot tutorials utilize two of these Mechanical Bumper Sensors. Please take this into consideration before placing your order. The wire is 0.025" in diameter and made out of spring steel. This should be about 22 gauge. Just a word of caution -- you need two of these to make your redbot look like the example in the final picture. The music wire used for this kit is 0.025"(.64mm) in diameter if anyone was curious. Can you add a picture of it assembled by itself without the RedBot? You don't real need a breakout board for whiskers. Definitely not one with 3 leads. OWW ! I poked my eye out %#%$$@# I think the whiskers should have loops on the ends for safety. Considering that the user needs to bend the wire to make it work in the first place, I think we'll leave it unbent for the time being. It would also add significantly to the time required to assemble the kit. According to our internal shipping calculator, it weighs about 6 grams. That's the whole kit- wire, screws, board, etc. I figured since it was just a bumper sensor that is supposed to send a 5V output signal when the rod is not in contact with the nut, the arduino would read this input fine and be able to respond accordingly, however this was not the case. The arduino would respond to the sensor correctly about 1 in 100 times. After about 12 hours of debugging my circuit, I ended up tossing the board and just mounting the stem to a limit switch which was 100% effective. Sorry to hear about the issues with the mechanical bumper sensor. Have you contacted our technical support department @ techsupport@sparkfun.com ? They're usually pretty good at getting these working, or helping to debug a system.